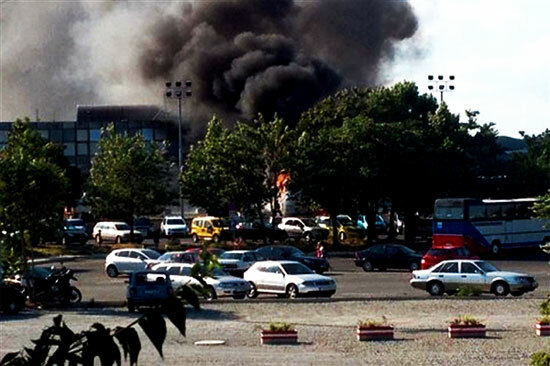 Smoke rises over the Bourgas airport in Bulgaria, after an explosion on Wednesday. Three people were killed and more than 20 wounded in an apparent bomb attack on a bus packed with Israeli passengers at a Bulgarian airport, officials said, with media saying the toll would rise. UPDATED AT 1:30 p.m. ET: SOFIA, Bulgaria — An explosion on a bus carrying Israeli tourists at an airport in Burgas killed at least four people and injured at least 30 others, Bulgarian authorities said. 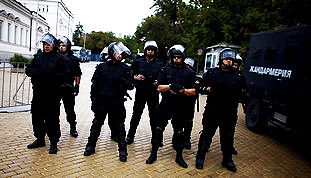 Bulgarian officials could not confirm the deadly blast was terror-related but Israeli Prime Minister Benjamin Netanyahu blamed Iran. “Iran is responsible for the terror attack in Bulgaria, we will have a strong response against Iranian terror,” said Netanyahu in a statement, according to Haaretz, an Israeli newspaper. Three Israelis were killed and many injured when a bomb exploded on an Israeli tourist bus at the airport of the Bulgarian city of Burgas on Wednesday, ZAKA reported. Mladenov is heading to the site of the blast and said that he will bring Liberman up to date when he arrives. Liberman called for an immediate meeting at the Foreign Ministry’s situation room to discuss the issue with the relevant bodies. The Israeli embassy in Bulgaria is also participating in the issue. The Sofia News Agency Novinite quoted Dan Shenar, head of security at the Israeli Transportation Ministry, confirmed he had requested the increased security at the time.